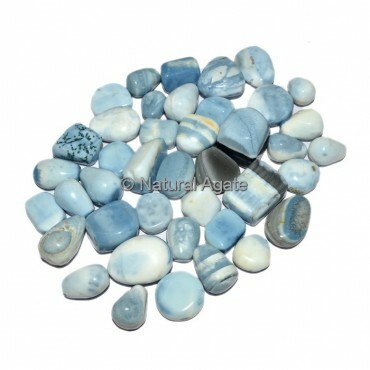 Blue Opal Tumbled Stones has dependably been related with love and enthusiasm, just as want and sensuality. It is an enchanting stone that escalates passionate states and discharges hindrances. It can likewise go about as a passionate stabilizer. Wearing an opal is said to achieve reliability and devotion.Blue Opal Tumbled Stones undyed stones stones full of energy. Blue Opal is a defensive stone for shamanic ventures and multi-dimensional investigation and uses the quiet, calm quality of Water energy for individual strengthening. This opal is a healing stone, since quite a while ago connected with the eyes.